Between 1991 and 1998, Alexander Jablokov published five noteworthy novels, then vanished from the face of science fiction for an uncomfortably long time. It seems that, as has happened to other authors, he was distracted by real life. Happily, this is not another P. J. Plauger affair: Jablokov did return in 2006, in short form, and in 2010 at novel length. 1992’s A Deeper Sea sets out, yet again, a lesson empires have learned and learned and learned … and forgotten every time. Lesson: the enemy of my enemy is not necessarily my long-term ally. Once the current conflict is over, the empire may find that the weapons it so considerately handed to its foreign cat’s paws are being turned on the empire itself. 2015: after years of painful recovery, Russia—now calling itself the United Soviet Republics—has set its eyes on the republics of Central Asia and the great Russian cause of stabilization, or as Russia’s unsympathetic critics put it, reconquest. Colonel Ilya Sergeiivich Stasov’s research into cetacean languages doesn’t obviously look like military research, but his breakthrough (torturing dolphins and their relatives into breaking over three millennia of silence) will have a profound effect on the coming war with Japan and its allies. Unlike the previous powers who have employed dolphins for military purposes, Russia isn’t content with drafting dolphins onto the Russian side in the Pacific War. They are equipping cyborged dolphins with a sophisticated suite of military equipment and sending them out to hunt Russia’s Japanese and American enemies. The dolphins take up this task with considerable glee, despite the horrific losses they suffer in the process. The Pacific War ends in a great victory but not for Russia. Now a shameful reminder of doomed ambition, Stasov is consigned to a Japanese POW camp in the Philippines. The camp is a miserable place, one that the scientist survives only because he is given a timely rescue by a former colleague. The world, it seems, still has a use for Stasov. Just because the Russians lost the war doesn’t mean that the military dolphins are in any way inclined to disarm. Human weapons give the intelligent cetaceans control of the sea, one they could never otherwise win. Dolphins and the other intelligent cetaceans plan to use this control, in ways that humans may regret. Dolphins have little love for humanity as a whole, but they still have a use for us. A use that will embroil us with the vast and distant intelligences living within Jupiter, beings who have far more in common with cetaceans than they do with clever landbound monkeys…. As odd as it may seem to contemporary readers, a plot featuring an imperialist Russia rampaging across 21st century Eurasia made sense at the time the book was published. It was written as the Cold War was drawing to a close, at a time when many people had a very hard time imagining what a world without an aggressive Russia would look like. Indeed, to this day there is a substantial body of people who appear incapable of imagining what a world without an aggressive Russia would look like. What seems odder to me is that Jablokov seems to have had no inkling that Japan’s Lost Decade had begun or that China was about to become an economic power of great significance. There is also the seemingly odd detail that the US of the novel is a second-rate military power reduced to funding the Japanese war machine. Though this might be explained as due to the fact that the USians of the time had a historically atypical reluctance to sending kids off to die abroad , a reluctance that they have long since shed. 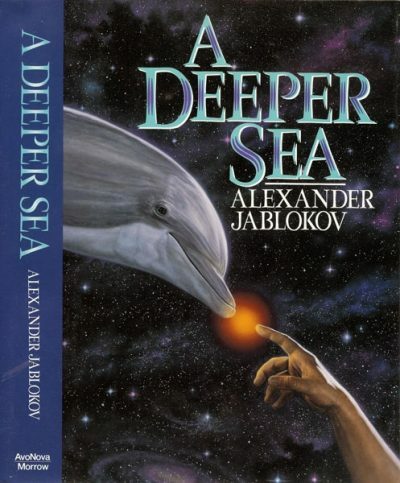 Jablokov is by no means the first author to use cetaceans in his fiction but he might be the first one who portrayed them as unrepentant assholes. Humans have built up a considerable body of belief about dolphins. Whether they are seen as bright animals or people, they are generally thought to be generally nice and helpful. A Deeper Sea’s cetaceans are gleefully nasty and spiteful; when the Russians foolishly arm their dolphins, the dolphins enthusiastically begin dealing out payback for millennia of mistreatment at the hands of humans. When the Russians collapse, the dolphins and their kin are quick to capitalize on the opportunity the foolish humans have handed them, in the process displaying an ingratitude towards their former allies worthy of Prince Felix of Schwartzenberg. Why great powers convince themselves that their allies of convenience (or allies who, like the dolphin, were bullied into the alliance) won’t turn on the great powers as soon as the Great Power loses its immediate utility isn’t clear to me. What is clear is that the great powers are often wrong. I was reminded somewhat of War With the Newts, although the dolphins, orca, and the rest of the cetaceans aren’t as overtly hostile to humans as the Newts are. (Not that I would give dolphins access to nuclear weapons, mind you.). Or perhaps the difference is the cetaceans still need humans as their hands, in which case it would be best if nobody explains telefactoring to the cetaceans. Jablokov’s books can be purchased here. 1: For example, the year after A Deeper Sea was published, the eighteen American deaths suffered during the First Battle of Mogadishu were seen as an extraordinarily terrible event, rather than business as usual (like the approximately three thousand casualties suffered by the other side ). 2: Or Canadians torturing POWs to death, which used to be a thing we liked to claim we opposed, and now accept as necessary policy. Nothing to see here. Move along now.